It’s too bad we’ve never figured out how to spread things around. I thought that earlier this year, here in the US, when the Midwest was flooding and the South was suffering a drought. 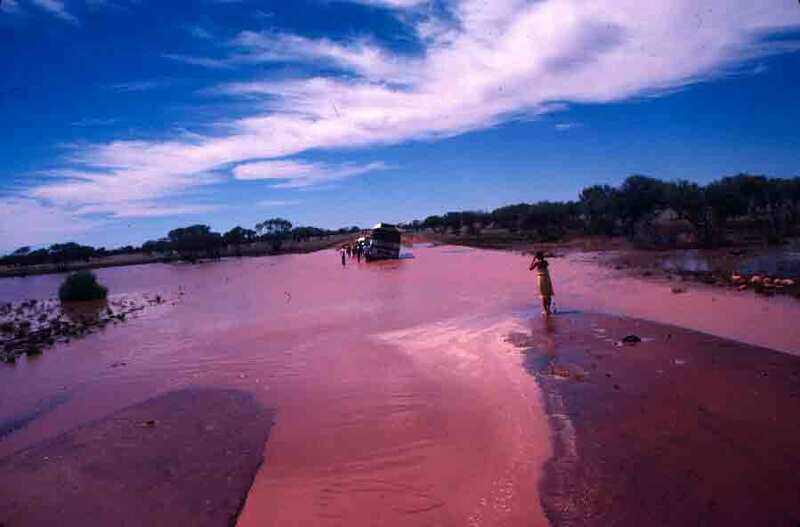 I just heard from a friend in Queensland, Australia, that they’re delighted that it has just started to rain, as they were suffering a drought–but it has only been about a year since we saw images of Queensland being washed away by floods. I experienced a bit of that “too much here, not enough there” during the drive back from Alice Springs. 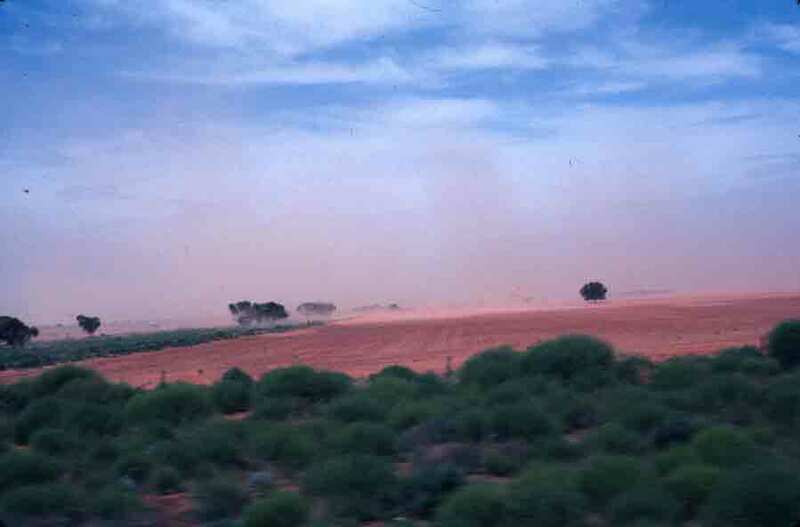 We left behind the flood damage shown in yesterday’s post, but a day and a half later, as we crossed from South Australia into Victoria, we ran into a dust storm. The wind was driving a wall of dry dirt from the parched fields in our direction. Astonishing to see so much dry after having had our lives dominated by water for almost two weeks. The photo below shows the wall of dust approaching. Those of you who have read or are reading the book will know that getting out of Alice Springs proved to be a challenge. The photos below will give you an idea what the roads were still like, even a week after the rains ended. 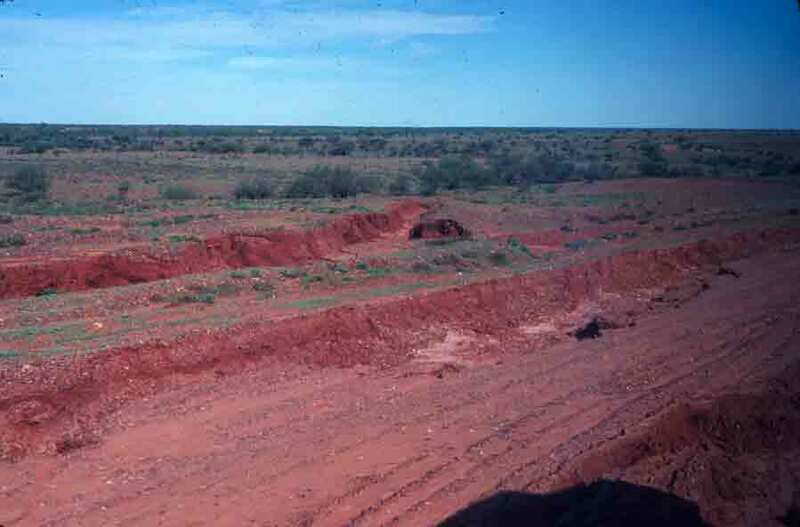 As noted in previous posts, the Red Centre had turned green, but the roads had turned to mush. Because we’d been detained for so long by the floods, we would be driving straight through to get back to our starting points– almost 2-1/2 days of driving with only occasional breaks for meals and leg stretching. Fortunately, most of the driving was through remote, rugged, and really beautiful landscapes that provided a nearly endless series of memorable images. And as always, the nighttime driving was magic, with stars reaching all the way to the ground on both sides of us. So while it wasn’t easy, it was still fascinating. As I mention in the book, rain clouds were gathering again as we enjoyed Alice Springs and vicinity. 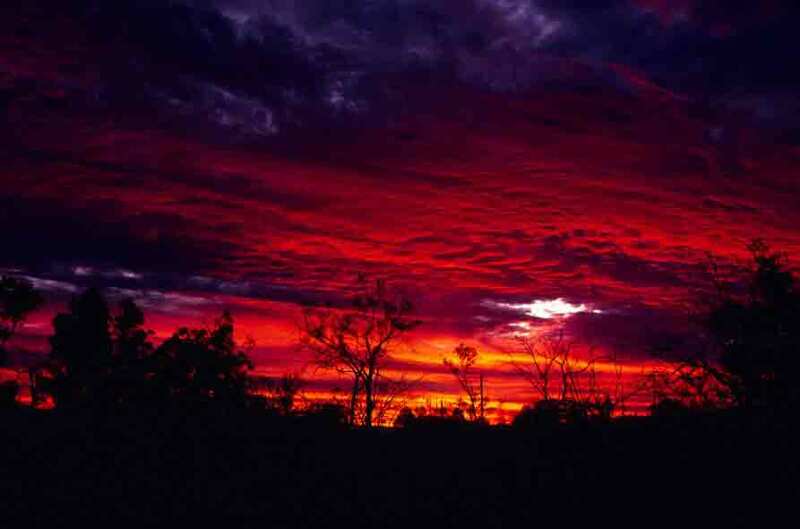 But clouds do have one glorious advantage — they can make for some really spectacular sunsets. I would soon be saying farewell to the Red Centre, at least for this first grand trip to Australia. I would return, but I couldn’t know that at the time. I love sunsets anytime I see them, but this one seemed to be particularly wonderful, though I know it was tinged with sentiment. The sky went through many changes as I sat on a hillside, watching it. The light show was fairly well along before I shook off the awe just enough to grab my camera and take a photo — but I think the photo will at least hint at how wonderful an evening it was. I had been to Simpson’s Gap on my previous trip to the Centre, but it was good to see it again. 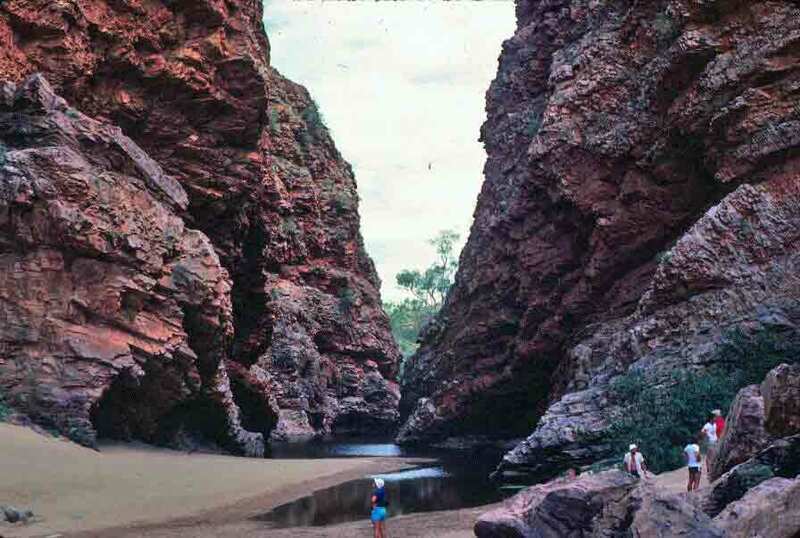 This is one of the several breaks in the West MacDonnell Ranges, where the ancient mountains are cut by a river that adds greenery and a fair bit of wildlife to the area. Once again, we scanned the rocks for signs of the rock wallabies that make their home here, wandered by the water hole, and admired the birdlife. I was also in love with the rocks, which are so worn and layered in these mountains–like the bones of the earth. On both visits during this first trip, to reach the gap, we waded up the dry riverbed, through soft sand. When I returned a few years later, I found that a walkway had been built, to make the hike into the gorge easier — though I’m betting part of it was also to keep people from stomping all over the scenery. Fortunately, though it is now easier to reach, Simpson’s Gap itself is unchanged — and is still quite wonderful.